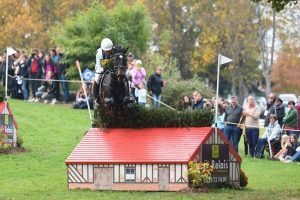 Pau 4* this year was a rollercoaster ride for competitors and spectators, with a huge leaderboard shake-up on XC day, Pierre Michelet’s course causing a lot of drama. Gwendolen Fer and Romantic Love, the winners. 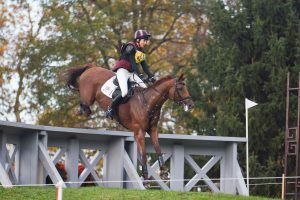 Australian Shane Rose’s CP Qualified led the dressage, but the very influential curving combination of a run downhill to skinny brushes over a ditch at fence 11abc (where the C element was later removed after the footing on the landing side of the far ditch deteriorated) caught them out. 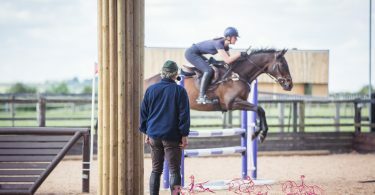 The slightest loss of control or deviation from the perfect line and spot was punished, and both Mark Todd and Andrew Nicholson also had problems there. Sarah Bullimore rode her 3 all into the top 10 after the XC, which surely has to be a record? Ros Canter’s Zenshera was the only one of the top 8 after dressage to stay in the top 10, but their 11.6 time penalties proved very expensive. Astier Nicholas moved from 14th to lead overnight after a fast clear, and Cedric Lyard was the only other rider to go clear inside the time, moving up to 4th. On a great day for the French, Gwendolen Fer, on the enigmatic Romantic Love, was clear with just 3.2 time, moving up to 2nd place. 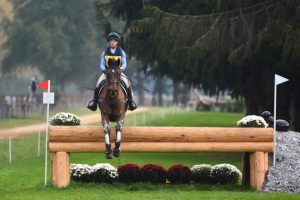 There were 28 clears, including established 4* combinations such as Sam Griffiths and Paulank Brockagh and Jonelle Price and Faerie Dianimo, but the course caught out many, with problems spread all around. The questions were unrelenting, every combination proving extremely testing. 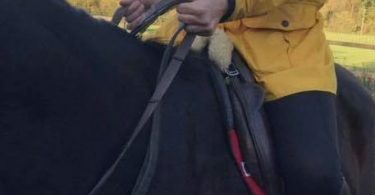 Nana Dalton probably pulled off the save of the day when somehow clinging onto Absolut Opposition’s neck after he rather ‘wore’ a drop fence, and getting safely back into the plate. Tragically, Boyd Martin’s ride Crackerjack, whilst cruising fast and clear, took a disastrous misstep between fences and broke down completely, necessitating his euthanasia. 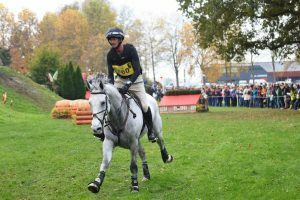 Every horse trotted up fine, but riders faced another stiff test. 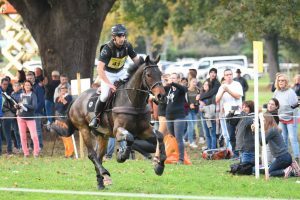 In particular the SJ course proved very influential for the overnight leader, their 12 penalties sending Astier Nicholas and Molakai down to 6th. Sarah Bullimore, whose Reve de Rouet has always promised so much, was left ruing the 2.4 time penalties she accrued on the XC, because just 0.1 penalty kept her off the top spot, with Gwendolen Fer taking 1st place with 45.1 with her enigmatic Romantic Love, who chose exactly the right weekend to hit top form. Cedric Lyard filled 3rd place, finishing on his dressage score, no mean feat at 4* level! Samantha Birch for Australia was 4th, and Alexander Bragg with Zagreb, in 5th. The final scoreboard is HERE. All photos by kind permission of Juan Luis Cabrera Garcia, for e-Venting.